Kimme may very will pass for an instant noodle brand but it isn’t one. It is in fact a restaurant named for its Korean chef-owner, Sun Kim, who snagged a star for his flagship Korean-inspired modern European restaurant, Meta, during Michelin’s sophomore edition in Singapore last year. Barely a few months after his win, Kim was already hatching a plan for a more casual offshoot. 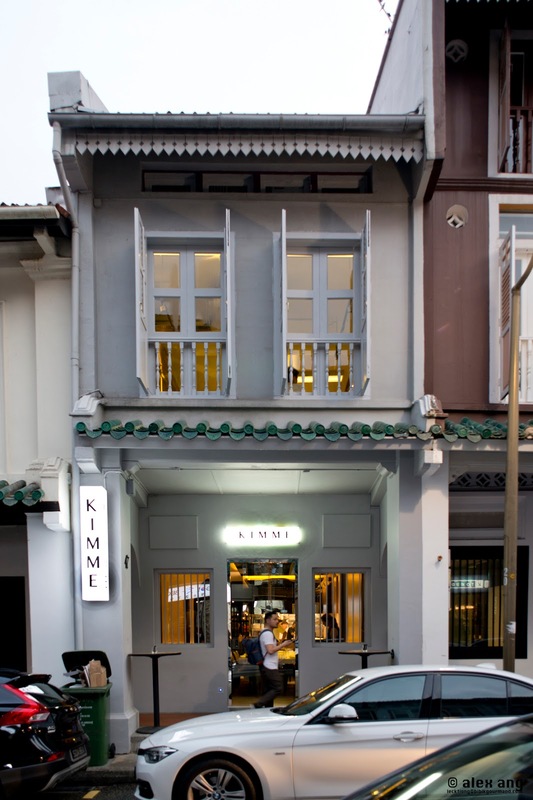 The result, Kimme, is a bigger, brighter and somewhat bolder eatery that opened in a triple storey shop house space in Amoy Street in early January. On the ground floor space is a brightly lit communal dining space with a gigantic 12-seat marble table that holds court next to an open concept kitchen, much like a chef’s table. If you value their privacy, you may prefer the intimacy of the second floor dining room where a bar abuts a rectangular dining room. At the moment, the mezzanine floor that sits atop the second storey has been left as a store room but in time to come, it will be converted into a private dining room. Food-wise, Kimme eschews tasting menus that are all the rage in Michelin stars-studded restaurants in favour of sharing plates. These dishes are neatly mapped out in a A5-size menu with three main headers – small (for starters), big (for mains) and sweet (for desserts). 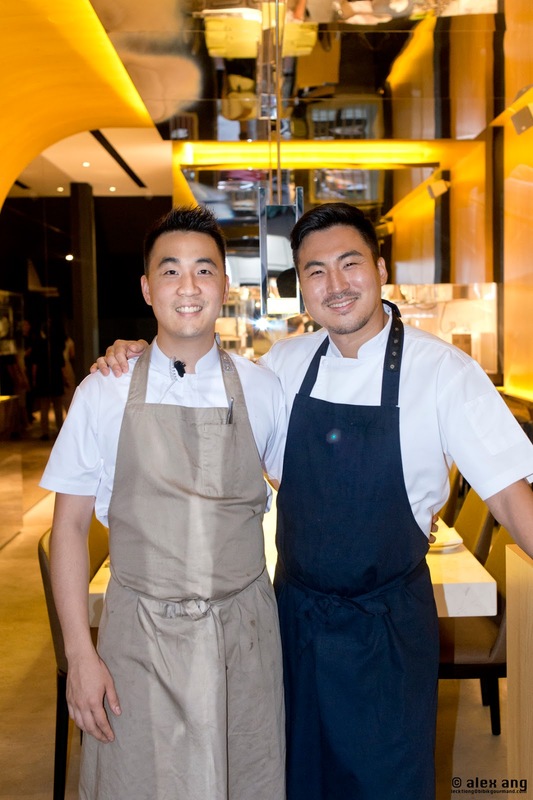 Like Meta, the kitchen led jointly by Kim and Korean head chef, Seok Hyun Han, a former sous chef at the flagship, employs Western cooking techniques. 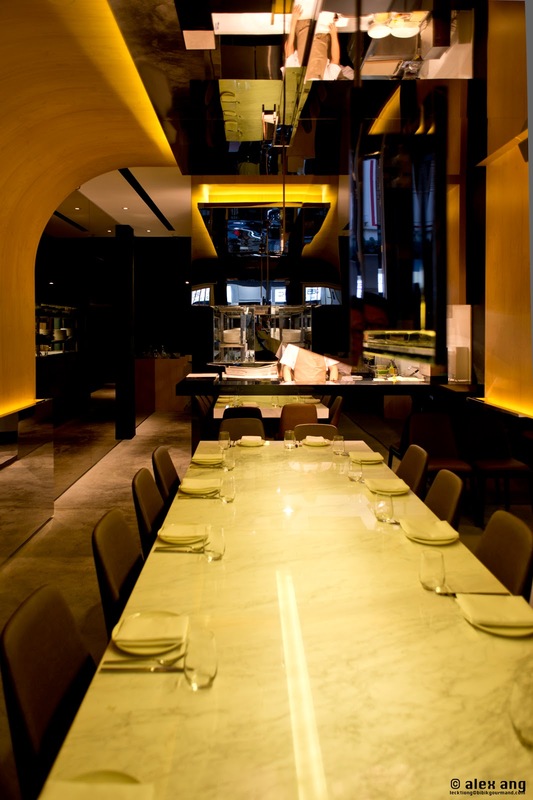 But at Kimme, the kitchen is given more leeway to play with Korean (predominantly) and also other pan Asian flavours. Kim wants you to know how the Koreans eat sashimi and how else better than to serve his interpretation by way of slices of kampachi sashimi ($22) wrapped around young pickled ginger and pomelo pulp that arrives in a pool of shiso powder-flecked chive oil and gochujang sauce refreshed with creme fraiche. At first bite, your palate is hit by the subtle heat of pickled ginger, then caressed by the sweetness of the pomelo and greeted by the spicy presence of the gochujang before is is mellowed by the chive oil and refreshed by the creme fraiche. The flavours will change progressively as they hit the palate but the landing is refined as it is delicious. If you like beef tartare, you will find Kim’s Korean take on this chopped raw beef dish refreshingly riveting. The hand-chopped wagyu rump is marinated in Korean soya sauce, Korean sesame oil, dijon mustard, chives and topped with a disc of quail’s egg yolk. At first glance, this beef tartare ($23) looks no different to the garden variety ones that we’ve seen, but the moment you take a bite of it, you’ll know that it’s destined for Korean greatness. Don’t forget to take each smidgen with a bite of the perfectly salted sago chips. You may have heard some industry chatter about a so-and-so XO sauce that is creating quite a stir in Chinatown. The “culprit” is an X.O. sauce, a heirloom recipe of a Malaysian staff from Meta, served here with King prawns ($30) that have been sauteed with the same X.O. sauce. But its excellence is not just attributed to the authenticity of the sauce, which happens to pack a delicious punch. 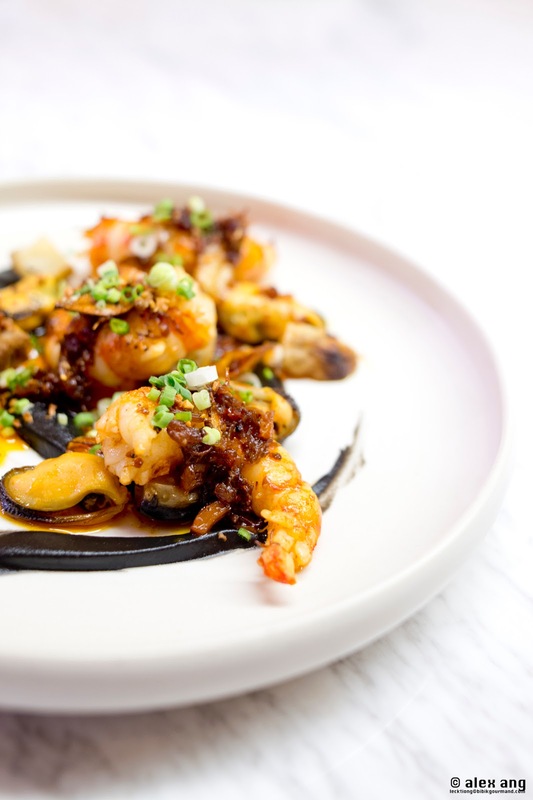 It’s also about how Kim has afforded its pairing with the unlikely bedfellows of squid ink-tinted Jerusalem artichoke puree, garlic chips and mussels. 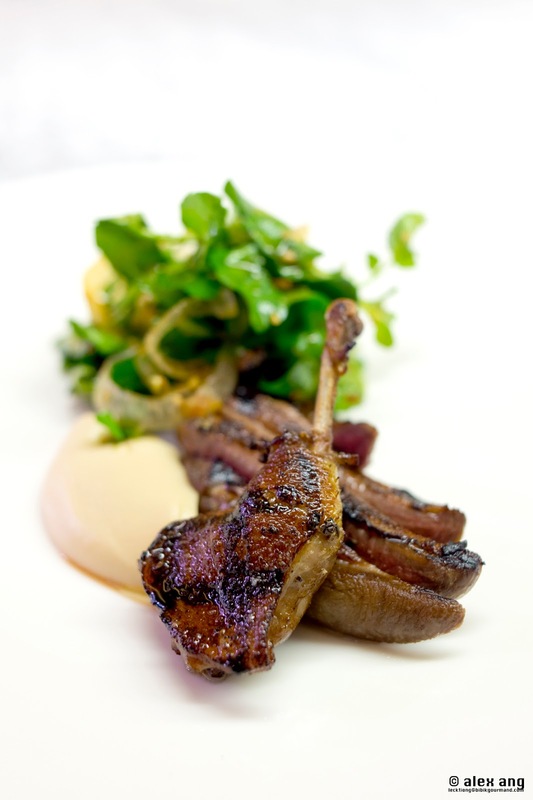 You may think that the best pigeon ($32) dishes reside in the city’s best French restaurants but Kim begs to differ. Indeed the pigeon itself is French (Brittany to be specific) but Kim’s preparation is anything but. First the chef makes a galbi sauce from scratch with ingredients like soya sauce, fish sauce, apples and pears that he marinates the pigeon with. The pigeon then goes on the BBQ and is served on a puddle of celeriac puree with a piquant watercress and onion salad dressed in a traditional Korean dressing of soya sauce and sesame dressing. A bite is all it takes to convince you that pigeons can be great when left to capable Korean hands. Kudos to Han for the immaculate execution. The same goes for steaks. 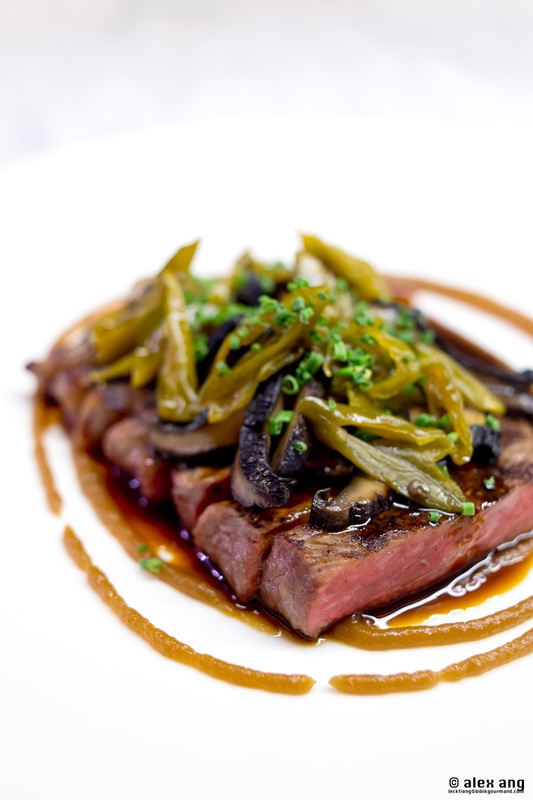 The Americans serve steaks ($45) neat but Kim serves it exactly the way he likes to eat it – with sauteed portobello mushrooms to lend umami, pickled shishito to cut the richness of the beef and a little pile of sweet onion puree. Even if you are a steak purists, you may be won over with this cluttered combination. With 20 items, including four desserts, on the menu currently, newcomers will understandably be overwhelmed. On this note, we propose three plates from Small, two from Big and one or two from Sweet for a table of two. Desserts wise, the strawberry, yoghurt sorbet with rhubarb and basil ($15) and mango, passionfruit sorbet cocooned in coconut cream ($16) will suitably impress. As far as execution goes, Kimme is hitting all the right notes in the hands of Han and Kim. Perhaps the only conundrum diners will get stuck with after dining here is how one pick between Meta and Kimme for the next dinner reservation? Amoy Street, chef sun kim, Chinatown, Kimme restaurant, Modern korean cuisine.